We spend a lot of time at Lustratus looking into the performance of early market companies. Quite often these companies brief us and tell us how well they’re doing and how well they’re latest re-positioning is being received in the market. Most of the time I believe them. And what if I don’t, what can I do to prove/disprove their claims? As an early market company they’re typically not public and probably don’t have to file detailed financial results. 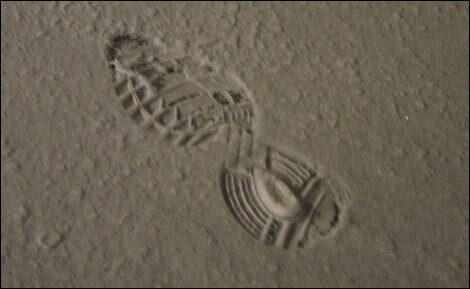 The answer lies in the footprints they leave in the Internet snow. That and something that we refer to as the Press Release Boilerplate Evolution. As you probably know, the boilerplate is the short, reusable text that appears at the end of press releases. But why is this text that is designed to succinctly describe the company to the press so important? Because it’s creation is typically one of the most political processes within a marketing organisation. Everybody has an opinion on the boilerplate text from the CEO down and because it’s tacked on to the end of the press release, everybody who reviews the press release during its creation gets to see it and pass comment. It therefore changes and develops over time. Just like the rings of a tree which reveal much about the environment that the tree was growing in at that moment in time, so each press release archived on the vendor’s web site reveals much about the vendor’s view of the then current trading, competitive and market environment. If you analyse the changes that are made at each stage over time, you can get a view of the vendor’s changing confidence, or lack of confidence in their current strategy. Some changes obviously reflect a healthy company tuning its strategy and adding more and more supporting information to the boilerplate that simply better describes the growing company. Other changes can reflect massive changes in strategy that might point toward a much more troubled organisation that is struggling to gain traction in the market. When this is represented graphically you can see the cumulative changes over time. The steeper the line, the greater and more significant the changes. As you can see from the diagram above (click to enlarge) Whilst 29West’s boilerplate remained static for a number of years of the early market company’s evolution – suggesting a committed long term focus, in recent quarters the company’s boilerplate has been through a number of rounds of changes. Most of these changes however were evolutionary, such as removing the overtly technical / product statements from their early years and replacing them with more business value statements as well as adding detail about new product developments and office openings, etc. 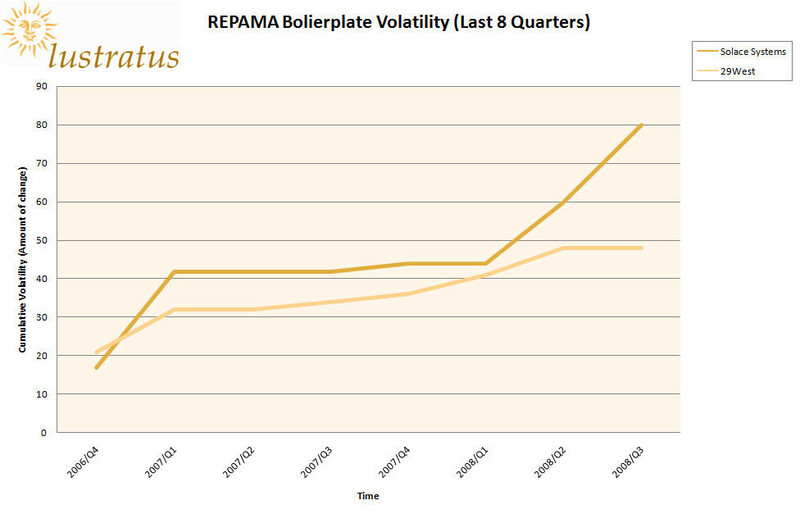 However Solace Systems’ boilerplate by contrast has seen a much more volatile evolution. Quite significant changes in organisational strategy, business model, target customer, pain solved and value proposition have been made over time. These changes point towards an organisation that struggled for some time to understand where its market was and how best to position itself and its offering. More worryingly perhaps for Solace Systems is the last 8 quarters chart that shows how stable the organisation’s strategy (such that it is embodied in the boilerplate) has been. The trend for Solace Systems, especially in recent quarters has been to make significant changes to its boilerplate. I’m sure Solace would suggest that this now reflects a better understanding of its market and given some of their recent announcements this is likely to be the case. So as these press releases are thrown on to the wires to end up in publications, web news aggregators or blogs. The trail they leave helps us understand a lot about what is really going on in an organisation. I’ll post something on the Boilerplate Delta (how far removed the boilerplate is from the current reverse engineered position) in a future blog. Posted in All Blog Categories, communication, high performance middleware, marketing, Marketing Strategy, positioning and tagged 29West, boilerplate, Boilerplate delta, Boilerplate evolution, low latency messaging, Marketing analysis, marketing strategy, pr, REPAMA.